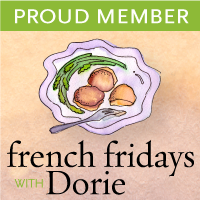 I’m taking a french class and I’m supposed to be doing homework right now but instead of cracking open La Grammaire Progressive du Francais I’m posting Friday night’s dinner here on my blog. I’m often inspired by the many food blogs that I follow as well as by the produce I see in the market. 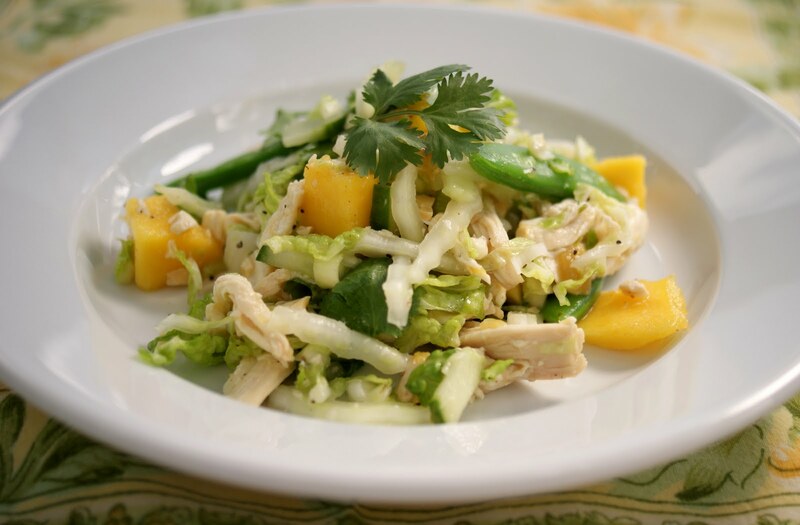 This week I bought two beautiful mangoes and had them sitting on my counter before reading the recipe for a delicious sounding slaw using mangoes, chicken and cashews at David Lebovitz. I went back to the market for cashew, chicken and some other ingredients to use in what became my adaption of his recipe. I’m also supposed to be playing in a golf tournament today but my son, Taylor came up for dinner last night and ended up spending the night so I opted to give him my place so he could play golf with his dad and they could have some father son bonding time. I’m actually enjoying some quiet time here at my kitchen table before I go visit my parents. We also enjoyed some delicious creamy zucchini soup from the Cookin’ Canuck with our chicken salad, I’m going to share the soup and some cookies I baked with my parents. The zucchini soup is a cream soup made using coconut milk and I recommend trying it this summer. So there you have it not one but two healthy recipes to enjoy! Poach the chicken in sparkling wine, 20 minutes on low simmer and then let cool in the poaching liquid. Remove the chicken from the liquid and shred the meat, set aside. Cut the mango in cubes, set aside. Blanch the snap peas and place in a bowl of ice water, drain when ready to add to the salad. Chop the cucumber in small pieces, I used an unpeeled english cucumber, set aside. Chop the raw cashews, set aside. Slice the cabbage in thin bite size strips, set aside. Wash and dry the cilantro, pick off the leaves from the stems and chop, set aside. Slice the scallions, using part of the green stems, set aside. Mince the jalapeno pepper and the garlic, place in a large salad bowl. Add the oil, vinegar, salt and pepper to taste. Whisk the dressing together and add all the other ingredients, giving the whole thing a good stir to mix everything together, adjust seasonings. This is a simple salad to make and would be good for a potluck or picnic salad. I also like it the next day when the dressing has softened up the cabbage. Thanks Nancy, I am such a space cadet, I used cashew nuts instead of pecans, so I had to edit the recipe but I think pecans would be great too! If you want to learn French…Paris would be a great choice…or you can come visit us in Montreal ;o)…lots of practical learning here! Love the blend of ingredients used in your salad…very refreshing. Wouldn't mind having some right now…I am feeling a little lazy in the kitchen this evening. Patty, Patty! I generally loathe poached chicken, but you had to poach it in WINE and get my attention right quick. I've already saved this one to try. Looks so summery fresh and flavorful–nommmm! so many wonderful ingredients!! I love snap peas and cashews….never thought of them in a slaw, what a wonderful combination! Poached chicken was a good choice, it will absorb all the different flavors. thanks for sharing, and glad to hear you got a little quiet time! like the way you let the chicken rest, like yourself… wonderful slaw and I esp like the dressing giving it a nice little surprise… I don't know if I could wait for it to set around to wilt or soften up…. I love the flavors and textures of your salad. There's just something about the combination of cashew and mangoes make it hard to resist. What a great combination of flavours! Good luck with the class, french grammar can be quite complicated! Lovely salad it looks very fresh.n Loved the colors. I love David's blog, and I always find such inspiration there too. I'm sure that the texture and flavor of this salad is spectacular. How exciting you are taking french lessons! One of my goals is to increase my fluency in French this year. Hopefully we will both make progress! Bon Courage Patty, avec la grammaire française !!!! C'est dur !!!! I like fruits in dishes. It gives the dish a nice lift. Good luck with FRench classes. Looks fantastic. I love champagne vinegar and am so happy to see it in here. Love the idea of this salad! It sounds cool and refreshing, perfect for summer! Oh well, you can practice French with me then :o) – Quelle salade colorée et parfumée j'adore la mangue en salade, elle apporte toujours une note exotique bien agréable! Très belle recette! Some of my favorite ingredients in your salad. Looks delicious! What a beautifully light meal! Wonderful flavor combination! I'm always on the lookout for new healthy dishes. This is not only nutritious, but it looks like it's full of flavors and filling with all the protein. Well done! Good luck with your French class. Love the flavors in this dish and the presentation. Bravo. I love mango anything this time of year, and this dish would be no exception! Very nice salad! I love these types of dishes in the Summer. This slaw looks fantastic, Patty! 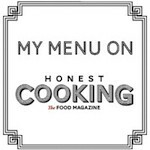 Thanks so much for the mention of my zucchini soup. I'm so glad you enjoyed it. That's so cool you're taking French class Patty! That was so nice of you to offer the dad & son bonding at the golf tournament. The salad looks so healthy and refreshing! Nice combination of the mango, cashews with a bit of heat from the jalapeno… light, summery and very refreshing! Patty, this slaw is so beautiful and looks so refreshing–perfect for summer. I like the addition of the jalapeño for a little kick! What a refreshing salad! Perfect for summer and easy for entertaining.